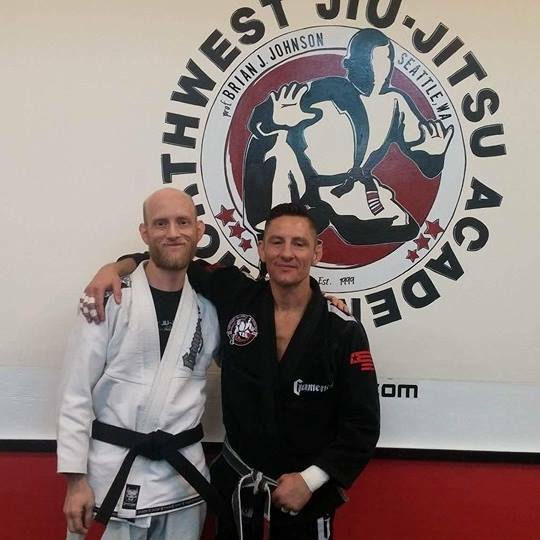 MKG Seattle BJJ Coach Phil Kleffner Earns His Black Belt! Our head BJJ Coach, Phil Kleffner, was awarded his black belt in Brazilian Jiu-Jitsu by Professor Brian Johnson last week. Earning a black belt in BJJ is a monumental achievement in the martial arts world. It usually implies 8-10 years of participation to move from white to blue to purple to brown and finally the coveted black belt. Professor Brian Johnson of the Northwest Jiu-Jitsu Academy is notoriously stingy in awarding this rank so we are especially proud of Phil for his accomplishment. Phil has been a part of our teaching staff for several years working with Professor Brian, Coach James Kessenich and MKG Seattle owner Andy Wilson on growing the BJJ program at MKG. We couldn’t be more proud to have him on our coaching staff. In the last year things have begun to come together with several students moving from white to blue and from blue to purple in large part because of Coach Phil’s dedication and attentiveness to his students. Please join us in congratulating Coach Phil! We currently have BJJ classes on Mondays, Thursdays and Saturdays and no-gi grappling classes (CSW) on Wednesdays. Come give it a try and say hello, and congratulations, to Coach Phil when he’s teaching.